Our clients depend on us to protect and transport their household belongings anywhere in the world. Managing the intricate steps involved in any international move requires working with a worldwide moving company with a systematic approach to planning but one that also anticipates the unexpected. Managing the intricate steps involved in any international move requires working with a worldwide moving company with a systematic approach to planning but one that also anticipates the unexpected. The key to your successful move lies with the experts who will help you along the way. Whether it’s our internationally-trained crew in your home or your experienced move coordinator managing all of the details, the role of all of our team members involved with international moving services is to understand your needs and translate these into action. Paramount was the first among Canadian international movers to gain its FAIM designation. Paramount was the first among Canadian international movers to gain its FAIM designation. This quality program was designed by Ernst & Young specifically for the international moving industry. All of the important aspects of the services which will impact your move are scrutinized by Ernst & Young. Companies like ours who are serious about quality have invested in FAIM so wherever possible, we select FAIM-certified companies as our partners around the world. A core commitment of our business is to deal with the most professional, financially-sound and ethical overseas moving companies and partners around the world. A core commitment of our business is to deal with the most professional, financially-sound and ethical international moving companies and partners around the world. Our team is continually visiting and re-vising foreign warehouse facilities and strengthening the partnerships we have around the world to better service our customers. Last year, we were in Dubai, Hong Kong and Shanghai. South Africa is always on our radar with an annual visit along with the Caribbean and Latin America. European cities and the UK are usually at the heart of several trips per year. Ho Chi Minh City, Quito, Athens? We were there recently or are on our way! Our team is guided by the highest possible ethics. Our business and international moving services and practices are all geared to protect your personal belongings and your privacy. We have an embedded culture of providing our customers with peace of mind, and reducing the natural stress that occurs during an international move. Moving overseas from Canada? Let's get started. Are you moving within Canada? Let's get started. A knowledgeable move manager will personally guide you through every step of your move. 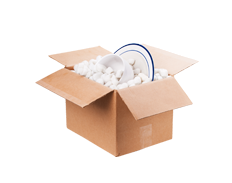 Our experienced and professional packing crews come to your home and ensure no detail is overlooked. Dedicated international moving services partners around the globe are there to help when you arrive at your destination. When our global partners, leading international movers, need help moving their clients to or from Canada, no other Canadian overseas moving company is called upon for help more often than Paramount. In 2015 we received feedback about our services from over 1,000 customers whose overseas moves we managed. When asked if they would either recommend Paramount to a friend or select us as their overseas moving company, 98.3% answered “YES”.